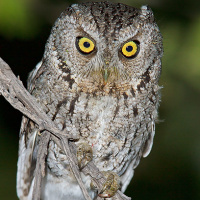 The Whiskered Screech Owl is a small screech owl with small ear-tufts. 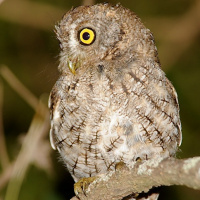 It occurs in a grey and red morph, with the red morph being more common in the south of its range. Typical call - Coronado National Forest, Arizona, USA. November 2014. CC Lance A. M. Benner. Typical call - La Cumbre, Oaxaca, Mexico. January 2009. CC Dan Lane. 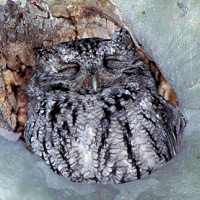 Description: Grey Morph: The facial disc is light greyish, with indistinct darker concentric lines around the relatively large, yellow eyes. It has a distinct blackish rim. 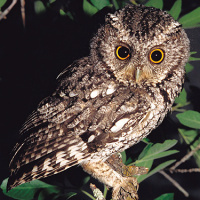 There are long, wispy whiskers at the base of the beak. Cere and beak are dark grey. Ear-tufts are short, and only prominent when erected. Upperparts are greyish to brownish grey with blackish shaft-streaks and dark horizontal branches, also with fine wavy patterns. The crown and back have broad blackish shaft-streaks and dark vermiculations. Scapulars have white outer webs with blackish edges, forming a white line across the shoulder. Wings and tail feathers are barred light and dark. 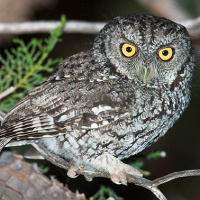 Underparts are lighter than the upperparts, with broad, blackish shaft-streaks, especially on the upper breast. 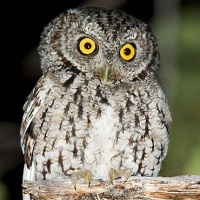 Legs are feathered to the base of the bristled, greyish-brown toes. 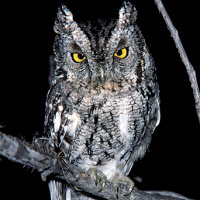 Talons are greyish-horn with darker tips. Red Morph: Similar to grey morph but less prominently patterned, and with general colouration rufous. Size: Length 16.5-19cm. Wing length 132-160mm. Tail length 62-79mm. Weight 70-121g. Females are heavier than males. Habits: Nocturnal. Shelters during the day close to a tree trunk or in dense foliage. Voice: A series of equally spaced hoots bububububububub, often with emphasis on the third note, slightly falling in pitch at the end. The female's voice is slightly higher in pitch than the male. Hunting & Food: Preys mainly on insects and other arthropods, such as grasshoppers, locusts, praying mantises, crickets, beetles, moths, spiders and caterpillars. Will also take small vertebrates. Hunts insects by foraging between branches, less frequently from a perch. Breeding: Little known. Nests in natural cavity, mostly abandoned woodpecker holes. 3-4 white eggs (average 33x27.6mm) are laid and incubated by the female alone. This probably happens during April. Male brings food to the nest during this time. After the young have hatched, the female shares the hunting. These birds are apparently very territorial, with territories averaging about 300 metres in diameter. 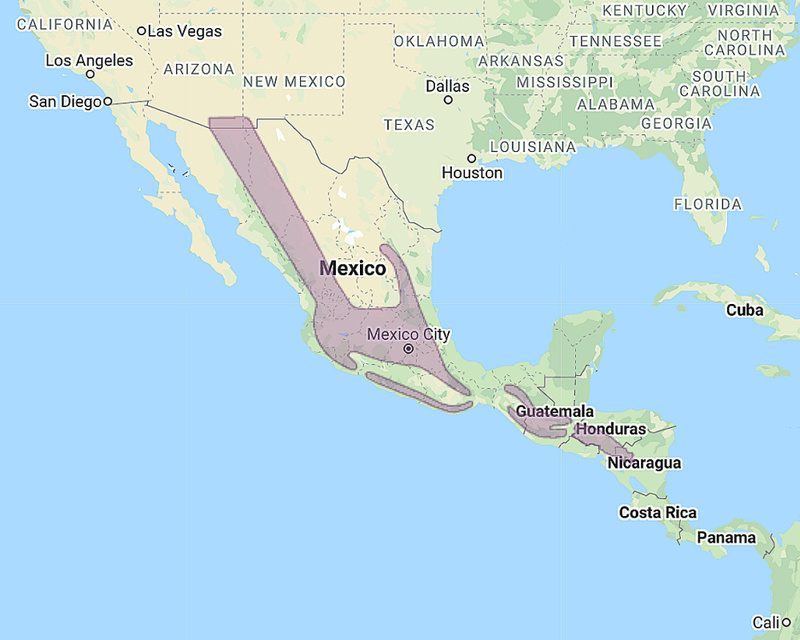 Habitat: Mountain forest (pine-oak woodland) from 750 - 2500 metres, usually above 1600 m.
Distribution: South east Arizona through Mexico to Nicaragua. Original Description: Wagler, Johann Georg. 1832. Isis von Oken, 25, col. 276-277.